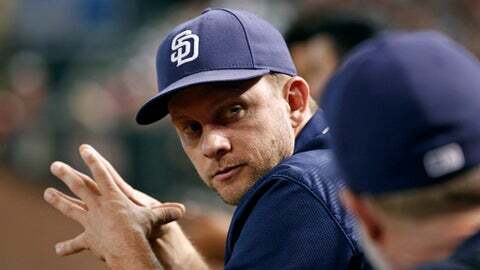 PEORIA, Ariz. (AP) — Despite all the young players in camp, San Diego Padres manager Andy Green asserts spring training is not a classroom and that players better be ready to execute at a high level. The club’s expectation is that it will improve on last season’s 68-94 record and last place finish in the NL West. Given the change in direction and emphasis on younger players, the challenge for Green appears formidable. Still, the energy level is high. Of pitchers on the Padres’ roster on the final day of last season, Christian Friedrich, Keith Hessler, Luis Perdomo, Colin Rea, Buddy Baumann, Brandon Morrow, Jose Torres, Kevin Quackenbush, Brad Hand, and Ryan Buchter remain. Among those in camp, Green identified veterans Jhoulys Chacin, now with his fifth major league team, and Richard as those with an inside track as starters. Otherwise, Green pointed out the field is wide open and there could be as many as 10 candidates for a rotation spot. Green is entering his second season in San Diego with a different outlook. Last season, it was necessary to learn about his players and establish a pattern.